Welcome to the 2018 ADEA Annual Session & Exhibition Program Planner. Envision the Future: We don’t have to imagine what the next generation of dental education might bring, because we are already living it. Phenomena in technology, health care, demographics and other areas can and will transform dentistry and how we teach. We know they are impacting our world today, but the question is: are we prepared to leverage them for the benefit of our profession, our students and society? The time to plan for 2030 is 2018, and the potential for the future of academic dentistry is limited only by our vision. We are pleased to bring you all the information you need to plan your experience in Orlando, FL in one convenient location. STEP 1: Use your Registration ID to log into the planner. STEP 2: Mouse over "Sessions” on the left side of the screen to browse conference content by date, title, dental discipline, session format, type, learning focus and speaker. STEP 3: Use the star icon to add presentations that you don't want to miss to your itinerary. 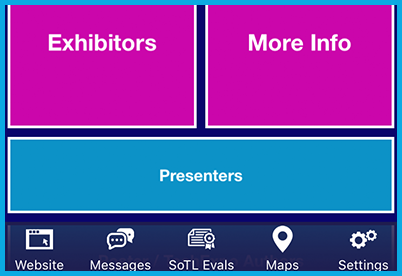 The ADEA Scholarship of Teaching and Learning (ADEA SoTLfest)-related sessions examine how teaching is valued, assessed and rewarded, and how it contributes overall to the learning experience of students and educators. You can be recognized for your participation in the ADEA SoTLfest. The deadline to complete the evaluation process and print a PDF of your CE Verification Form was April 30, 2018. Attending educational sessions with CE indicated in their entirety. Questions concerning completion of the evaluation or printing and saving a CE Verification Form or ADEA SoTLfest Certificate may be directed to support@ConferenceHarvester.com or 410-638-9239. ADEA is an ADA CERP Recognized Provider. ADA CERP is a service of the American Dental Association to assist professionals in identifying quality providers of continuing dental education. ADA CERP does not approve or endorse individual courses or instructors, nor does it imply acceptance of credit hours by boards of dentistry. ADEA designates individual educational sessions for various continuing education credits. Please refer to individual educational session descriptions for detailed information. All speakers agree that they do not have any financial relationships with commercial entities that may be relevant to their presentations. 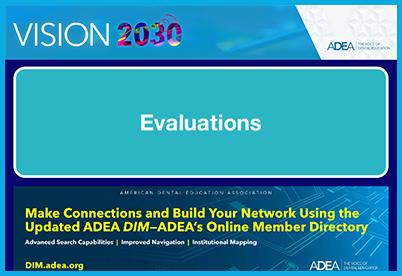 The ADEA Annual Session Program Committee thanks those who assisted in peer reviews of submissions for the 2018 ADEA Annual Session & Exhibition, the ADEA Poster Presentations and the ADEA TechExpo. View peer reviewers.